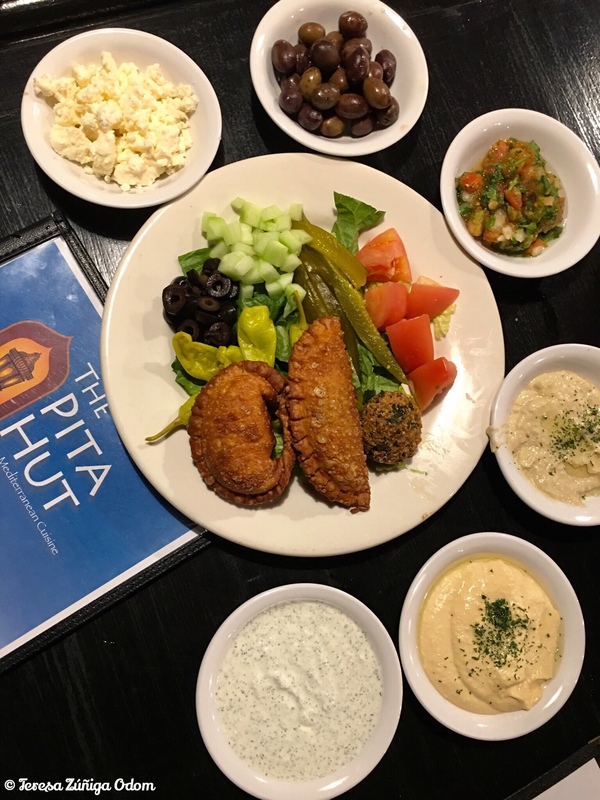 The Pita Hut, located in Chelsea Corners is the home of some fabulous Mediterranean food in Shelby County! I got a text from my friend Lisa Pruitt last month saying we needed to try out a restaurant in Chelsea called The Pita Hut. Well, I’m always up for a night out with Lisa and her husband Johnny so of course I said yes! But I also wondered why she wanted to drive all the way to Chelsea from Hoover on a Friday night for dinner. I was curious, to say the least! Turns out, Lisa has a friend who is close friends with The Pita Hut owner, Joseph Matta , and she wanted us to go try the food! Joseph has been in the restaurant business for some time now and has been at his Chelsea location since early 2014. I wasn’t sure what to expect to be honest. I mean, based on the restaurant name, I really thought we would be having pita sandwiches and soft drinks. Boy was I ever wrong! 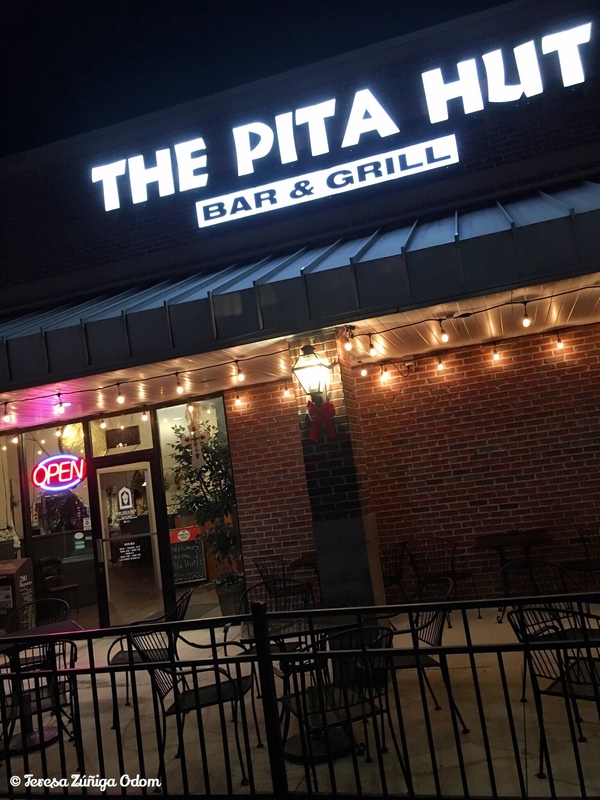 The Pita Hut is located in the Chelsea Corners strip mall right off of Highway 280. Coming from Hoover, it was a bit of a trip and when we arrived we weren’t sure where the restaurant was situated. We quickly found it nestled in the corner of the strip mall. When we walked in, there were several couples having dinner and it felt quite intimate. 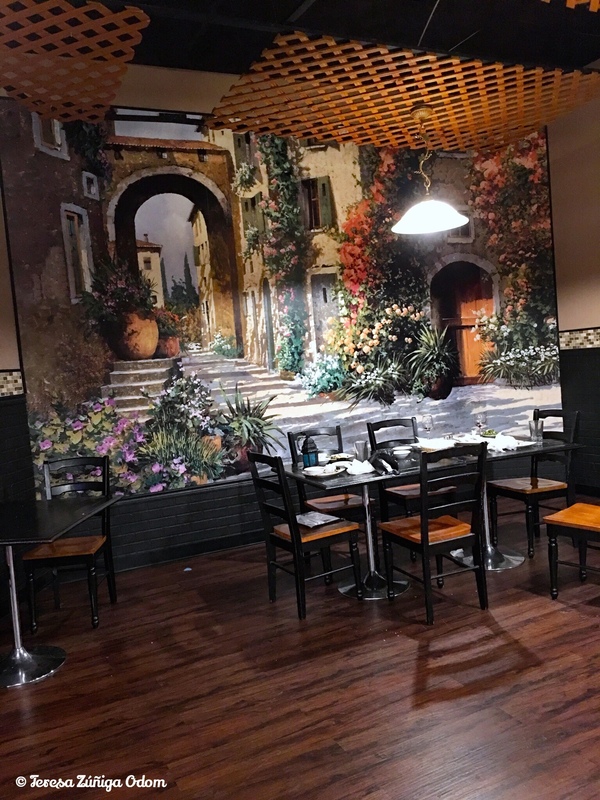 There is a beautiful mural on the back wall of the restaurant so when the hostess asked us where we wanted to sit, I pointed to the tables right in front of the mural. It was picture perfect! Beautiful mural in The Pita Hut! This is where we sat that Friday night. Soon we were ordering wine and carefully studying the menu. We quickly discovered the options were endless! While they do a sandwich type business during the day, the evening is reserved for a more white tablecloth offering. We decided to order the sample appetizer platter while we were mulling over our dinner options. The sampler included baked pita chips, fresh pita, hummus, baba gannouj, taziki, salsa, falafel, spinach fatayer, beef fatayer and olives and cheeses. That was a feast in itself!!! Plus, they brought out fresh homemade hummus and pita chips right before the platter arrived! We decided we needed to pace ourselves!!! The sampler platter was a meal in itself! Next thing we knew, Joseph the owner was at our table to welcome us and see how things were going. Lisa told him of their mutual friend and we asked him about his business. As he spoke it was clear that Joseph considers himself a chef and an artist. He relishes in creating foods that leave his customers coming back for more, not only because the food is delicious but also because of the beautiful presentation. He mentioned his catering business and from the sound of it, the catering side of his business is quite strong! So after our appetizer sampler and a little tabouli salad, Joseph asked us what we wanted our entrees to be. I was really interested in the shrimp adobado plate and curious as to why a Mediterranean restaurant would have something with Mexican adobo sauce on the menu. As it turns our, Joseph once lived in Texas and worked/managed a Mexican restaurant! Homemade hummus and pitas…Joseph sent us all home with some that night! Fatayer – fried dough stuffed with spinach and beef along with onions,, pine nuts and seasoning. After we had a chance to fill our plates and sample everything, Joseph came out to check on us and we were collectively oohing and aahing. The flavors were all so incredible and complementary. I asked Joseph about one of the flavors in particular. I was getting a hint of cinnamon in the kefta and he said “That’s right! We cook with 7 different seasonings and that is one.” It was an unexpected one! I mean, I wouldn’t think of a cinnamon flavor in a meat dish but it definitely worked! We stuffed ourselves so much that the idea of dessert should have been out of the question. But we still wanted to sample so we got the baklava to go. Joseph surprised us with containers of his homemade hummus and chips too. Lisa and I also couldn’t leave without a photo of Joseph in front of his beautiful restaurant mural. He was more than happy to oblige as we thanked him for a wonderful dining experience! 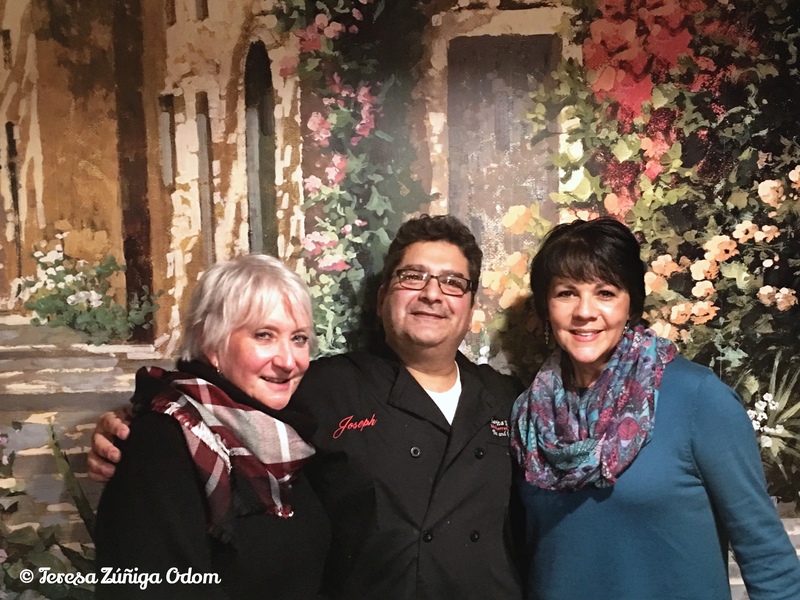 My friend, Lisa Pruitt and I with The Pita Hut owner, Joseph Matta in front of the lovely restaurant mural. We were stuffed at this point! There are a few takeaways from this night that I still think about. First, you know the old saying about not judging a book by its cover? Well, there’s definitely a whole lot more to The Pita Hut than I expected! The dining experience was top-notch and I want to really emphasize how wonderful it was! I know it’s off the beaten path for me personally since I live in Hoover but I loved the fact that a friend who lives in the Chelsea area commented on a photo I posted and how much she loves the place! Secondly, it’s great to see unique restaurants all over the Birmingham region popping up these days. Granted, The Pita Hut has been here for several years but that just goes to show you can always discover something new in places you don’t necessarily frequent! Which leads me to my third takeaway…spreading the good news by word of mouth, or in my case…through a blog post! The Shelby County area has definitely seen a surge in population over the past ten years or so and so I suspect more and more places will be popping up. But Joseph’s Pita Hut is well established and I highly recommend you give them a try! As for me…I’m ready for a return visit and I already have a few new items I want to try…like the Mediterranean pita quesadillas! This entry was posted in Food, Restaurants and tagged Chelsea Corners, Joseph Matta, Mediterranean Cuisine, The Pita Hut on February 26, 2018 by Southern Señora.